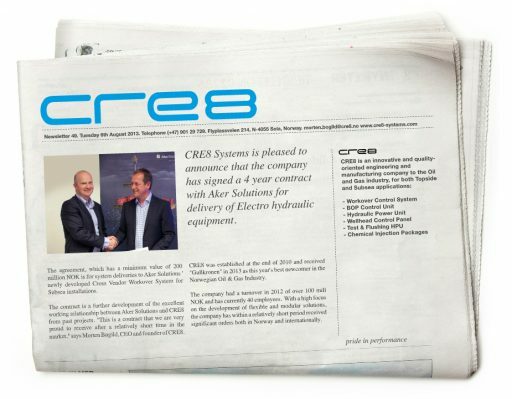 CRE8 Systems is pleased to announce that the company has signed a 4 year contract with Aker Solutions for delivery of electro hydraulic equipment. The agreement, which has a minimum value of 200 million NOK is for system deliveries to Aker Solutions’ newly developed Cross Vendor Workover System for Subsea installations. The contract is a further development of the excellent working relationship between Aker Solutions and CRE8 form past projects. “This is a contract that we are very proud to receive after a relatively short time in the market,” says Morten Bøgild, CEO and founder of CRE8. CRE8 was established at the end of 2010 and received “Gullkronen” in 2013 as this year’s best newcomer in the Norwegian Oil and Gas Industry. The company had a turnover in 2012 of over 100 mill NOK and has currently 40 employees. With a high focus on the development of flexible and modular solutions, the company has within a relatively short period received significant orders both in Norway and internationally.